Acknowledged as the principal event for designers of ceramic products, alternative surface coverings and innovative bathroom furnishings, the international Cersaie exhibition took place from 23-27 September 2018 in Bologna, Italy. As recurring visitors to the exhibition, Marshall Bull were eager to explore the newest ranges available to share with our clients. The industrial, utilitarian interior design aesthetic, featuring neutral tones and rugged, raw textures shows no signs of diminishing. Highlighting surfaces and design elements that were originally intended to be concealed, finishes of concrete, metal and distressed wood are still extremely popular across residential and commercial spaces. As the trend continues to evolve, the introduction of movement and colour variations into the tile is becoming increasing prevalent. From the inclusion of the 3D effect of a concrete cast in the form-work to reinforced concrete, complete with rusted iron bars, concrete concepts are beginning to relax and replicate the material as it would behave and change, naturally over time. This is also exhibited in metal style ceramics. By replicating the oxidising effects on metal continuously exposed to the elements, the stark, tough expression of metal is tempered and softened. Imitating oxidisation invites different shades of blue, orange and rust to the tile surface, making each tile fascinatingly unique. 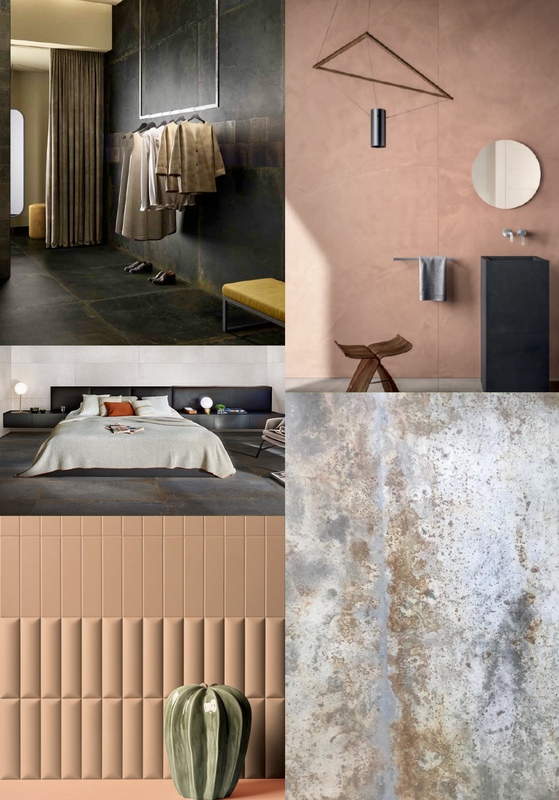 Perhaps as a response to the industrial inclination, or even as a compliment to it, warm colours and inviting textures have been prominent at Cersaie this year. As manufacturing techniques and 3D printing capability continue to develop across the construction industry, the intricacies of design and possibilities of pattern are boundless. Combining sophisticated patterns with warm, earthy shades like clay, tan and caramel, compels the viewer to touch the piece. The 3D surface adds dimensions with light and shadow making the material tactile and welcoming. Tile manufacturers are now expanding their service offerings with bespoke, tailored furniture manufactured from a variety of porcelain finishes consistent with floor and wall tile collections. Offering a holistic design service including wet room and bathroom furniture is something Marshall Bull will be offering in the coming months. Whether it is a coordinating or contrasting concept, we can now assist with designing your entire bathroom, creating a unique space adapted to suit your needs and style aspirations. In 2016, TAG Farnborough introduced their newly refurbished executive lounge area. Situated above the main lounge area, the space is accentuated using a neutral palette of chocolate, coffee, tan and dusky greys, offset with bursts of yellow to elevate the area. Continuing the renovation works into this year, Marshall Bull are delighted to be a part of the project, supplying the tiles for the private executive bathrooms. Walls will be fitted in the Woodside Oak range, extending the preference for a natural palette. The rectified glazed porcelain tile combines the organic irregularities found in a wood finish with high performance and durable stoneware. Perfect for merging internal and external spaces and available in a variety of shades and sizes, the range is versatile enough to compliment and enhance most spaces and environments. To juxtapose the warm, muted Woodside, the flooring used the more elaborate Déchirer Deco in striking black. An innovation in the field of ceramics, Déchirer is the first of its kind, displaying a decorative relief of varying heights that is both visually exquisite and barely perceptible underfoot. Choosing to merge both the Woodside and Déchirer within the same space unites the two different styles which appear to have the ability to both complement and collide simultaneously, unveiling a new texture, shade or interpretation at every viewing. As we continue to develop our services into the commercial market, involvement in this project has enabled us to showcase our creativity within the aviation sector. We are excited at the prospect of continuing this innovation in design for projects to come. 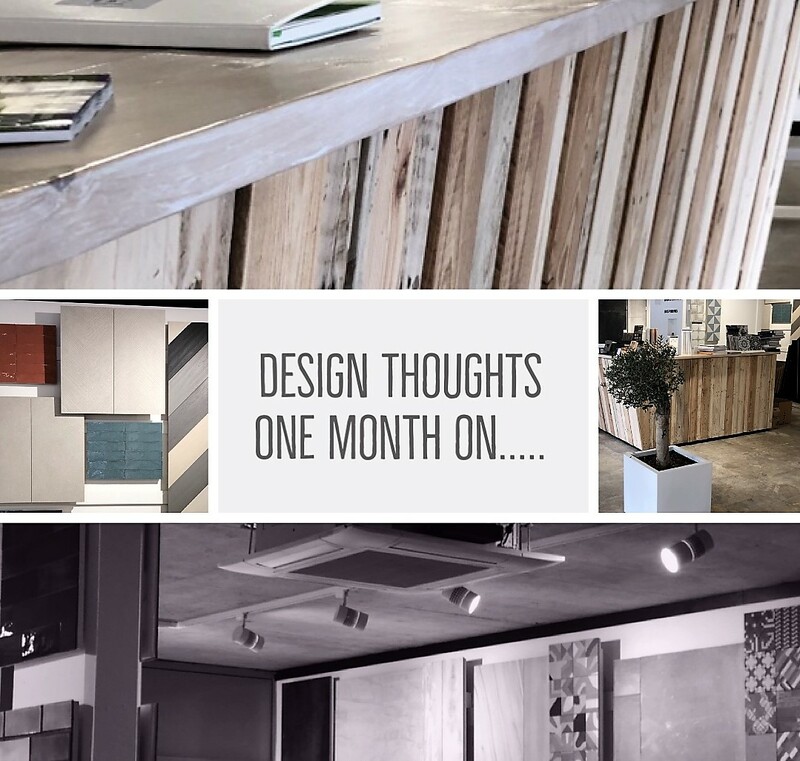 Showroom Design thoughts, one month on…..
On Friday 9th June, Marshall Bull opened the doors to its new location in Westcliff-on-sea. Now, one month on, we have been overwhelmed with the reaction to the showroom from clients and residents of the surrounding local area. 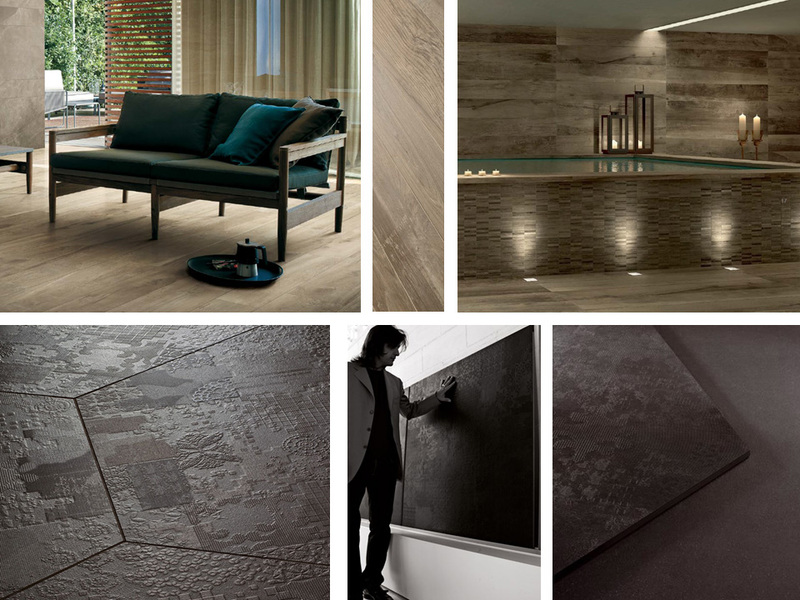 The showroom accommodates an enormous selection of tiles, contrasting in style, shades, size and texture. One of the most prominent drivers for the design was utilising the space to enhance the display, with a harmonious flow of products rather than styles and colour palettes competing for consideration. Stripping back the original ceiling plaster exposed the concrete ceiling structure. With unusual flecks of orange, blue and grey against the concrete back drop, the ceiling provided a fortuitous inspiration for the industrial style used throughout. Large scale Azione Dark floor tiles measuring 3.2x1.6m each; mirror the ceiling format incorporating shots of blue and orange into the tile. A total of only 32 tiles were used to accommodate the entire space. Exposed services and track spot-lighting, commonplace in gallery environments, complete the industrial aesthetic. The central desk to welcome visitors is fronted by up-cycling tile storage pallets usually used for distribution and shipping. The use of wood provides a subtle warmth to the space, painted white and sanded to an almost sun bleached effect. Tile displays were carefully curated to inspire clients and potential customers, giving the ability to view the tiles as separate pieces, envisaging the products in their homes and commercial spaces. Layering shades and patterns also encourages the audience to consider complementary tiles and cultivating a design bespoke to their space. Wall displays are mounted on wooden slates, allowing future flexibility and enabling displays to be completely refashioned to accommodate new products. Racks are also spread throughout the shop floor, allowing tiles to be tilted from a vertical to completely horizontal position, accounting for variances in lighting and offering a clear impression of the tile post installation. We are delighted to have had the opportunity the bring our vision into reality and now, one month on we have been so excited to receive so many visitors who are as astonished and inspired by the space as we are. Situated in the heart of the Leigh Conversation Area, SKA Architects led the refurbishment, remodelling partial demolition and partial re-build of the residential buildings 30-34 Leigh Hill, Leigh on Sea. The historic buildings had previously been derelict for a number of years, necessitating the need for the design to consider both the traditional restoration in addition to conceiving a concept for modern living. The concept for the tiles used throughout reflects the client drivers of combining the old and the new. Kitchen and Dining area floors from the Woodside range seamless transition between the spaces, guiding the direction to the outdoor garden area and the coastal views beyond. 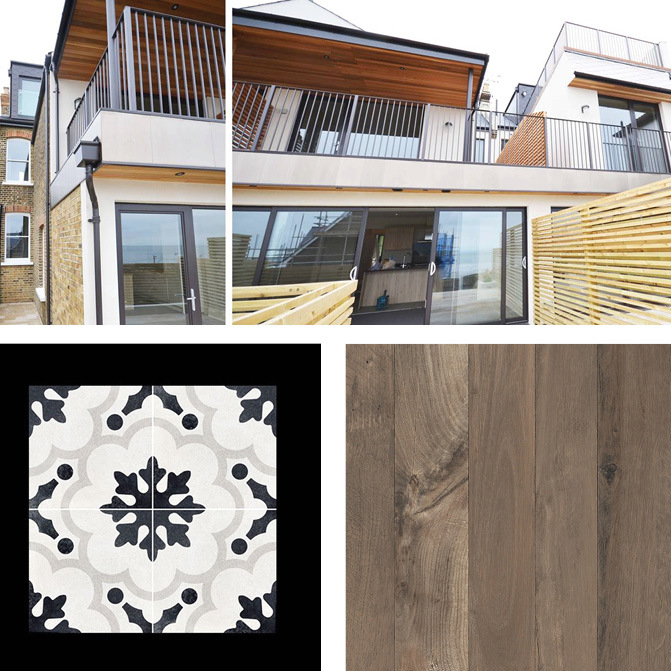 The rich luxurious nut shade complete with the natural irregularities of wood, combines the high performance of porcelain stoneware for a durable, versatile and relaxing space. Leading to the kitchen and dining areas, the aptly named Vintage Black and White porcelain stone tiles, unite classic geometric patterns with a contemporary monochrome finish. 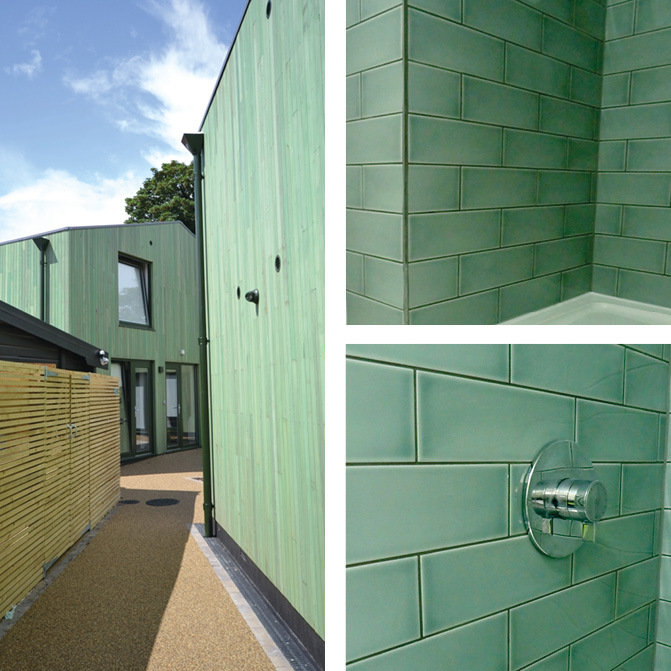 Bathrooms and En-suite walls and flooring throughout the properties were finished with tiles from the District range. Simple yet captivating, retro glazed ceramic wall tiles for the shower areas reflects the light, giving a fresh, elegant and spacious feel to the rooms. Complementing porcelain floor tiles with a natural and ant-slip finish complete the space incorporating safety, stability and style. Restoration with additional contemporary design aspects presents a living environment that is both aesthetically pleasing and ergonomically functional. As we see no signs of the desire to incorporate the old with the new decelerating, it provides a multitude of concepts and ideas we are always keen to explore and bring into reality. The Royal Institute of British Architects (RIBA) East Design Award, celebrates outstanding concepts and innovative buildings within the architectural field. For over 180 years the prestigious awards are internationally recognised as a mark of excellence within the industry. White Heather House is a truly inspiration and deserving project Marshall Bull is exceptionally proud to have been a part of. The redeveloped Bradbury Centre, female only training and accommodation unit, provides emergency homes for vulnerable women in the York Road location of Southend-on-sea. Architect Steve Kearney design concept and vision provided an inventive solution to the challenges of a restricted site. Positioning three new buildings around a central space maximises the available area, providing compulsory privacy, shelter and security for the residents. Fit out of the bathrooms within White Heather House incorporated wall tiles from our District collection. Retro glazed ceramic tiles reflect light across the shower facility, naturally illuminating the area and giving the impression of a larger space. Contemporary colour is included for a modern, stylish finish, in addition to durability and resistance against continuous use and exposure to moisture. HARP, Southend’s Homeless Charity, was also awarded Client of the Year. Supporting local people to overcome homelessness, providing tailored, innovative solutions for specific groups to get the best possible results and help as many people move on as possible. Creation of a safe and comfortable environment for those in need, such as this, was a genuinely fulfilling yet humbling experience. It provokes further discussions on using our expertise to assist those less fortune, changing their lives for the better and sequentially transforming the landscape of our town. Regeneration’s positive effect on those living in the surrounding areas and the prospect of influencing further project investment is something we are hoping will be a legacy associated with this project.